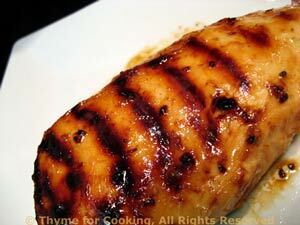 Thyme for Cooking easy recipes: Golden Chicken Breasts. 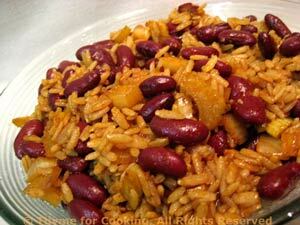 Red beans and rice with a twist and a chicken breast with a kick: easy summer cooking. Look for quick cooking brown rice, be patient or substitute Basmati. Put chicken breasts in shallow baking dish (or something with sides) and pour marinade over. Cook on barbecue grill for 12 - 15 minutes or until done. Test by taking a peak - stick a knife in the center and see if it is still pink - if it is, cook another 5 minutes. Or can be baked in 400F oven for 20 - 25 minutes or until done - test. Remove and serve, sliced if you like. Add paprika, onions and celery and sauté until tender, 6 - 8 minutes.